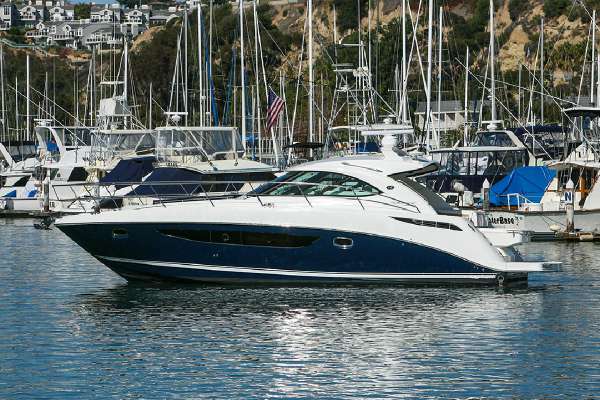 2013 Sea Ray 410 Sundancer The 410 Sundancer is the very essence of a Sea Ray Sport Yacht. 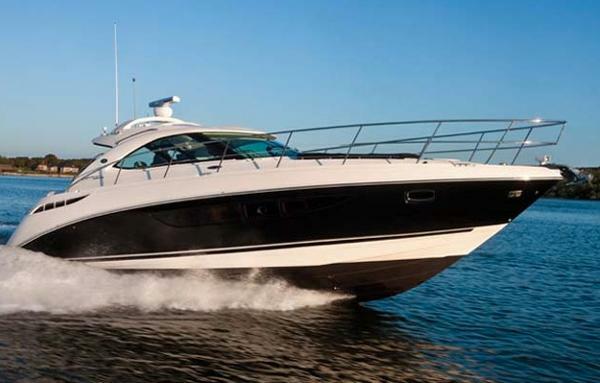 It is available in sport spoiler, open hardtop and enclosed hardtop versions, and can sleep six in a forward stateroom and convertible sofas in the salon and mid-berth. Two heads add convenience. A second stateroom with twin berths is available in place of the dinette. Zeus pod drives are optional. 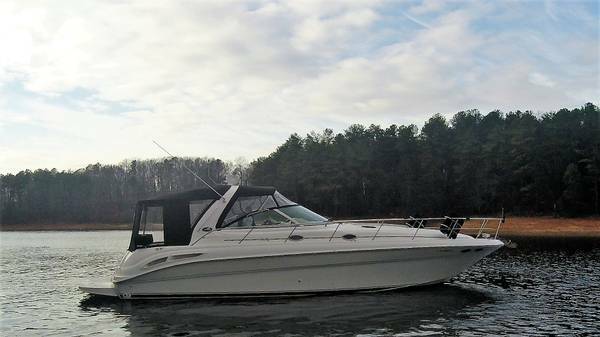 Key Features Optional Zeus® propulsion with helm joystick & Skyhook® station keeper Optional open or enclosed fiberglass hardtop Kohler® 10.0 kW generator. 32,000 BTU zone-controlled air conditioning system. Sony® Stereo and CD with iPod® Connector. Sirius® satellite receiver with antenna (N/A outside N. America) Standard 32" flatscreen TV with remote DVD in salon Custom Sea Ray® thru-bolted stainless steel cleats. Standard innerspring mattress in master stateroom. Solid surface breakfast bar. 2013 Sea Ray 410 Sundancer "Family Time" is the only 2013 Sea Ray 410 Sundancer available with the optional 480 hp High Output Cummins ZEUS Engines. She has been in Fresh Water since new and sets the standard in luxury sport yachts. This owner spared no expense when ordering this vessel. An already well appointed cockpit is topped off with Real Teak Decks throughout the cockpit & swim platform. 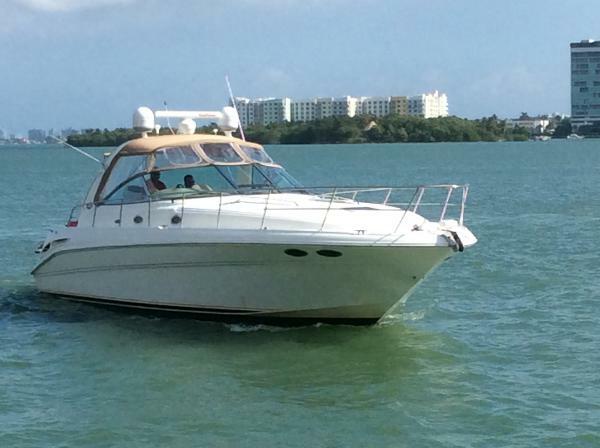 She has dual Raymarine E125's with Radar , Chartplotter , and GPS. KVH Satellite TV, Raymarine Night Vision, and Cockpit TV. ZEUS Pods with joystick control, and upgraded flatscreen TV's in the Salon, Master & Mid-Cabin. 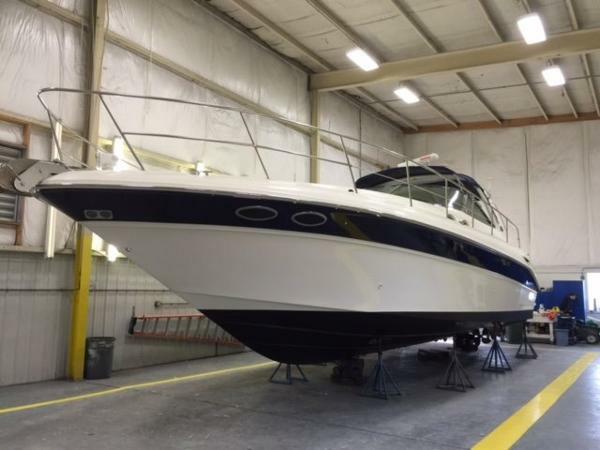 With full warranties and only 60 Hours on the Cummins 480 ZEUS Engines, this boat still smells new, feels new & looks new! Call today for an appointment or for more information. 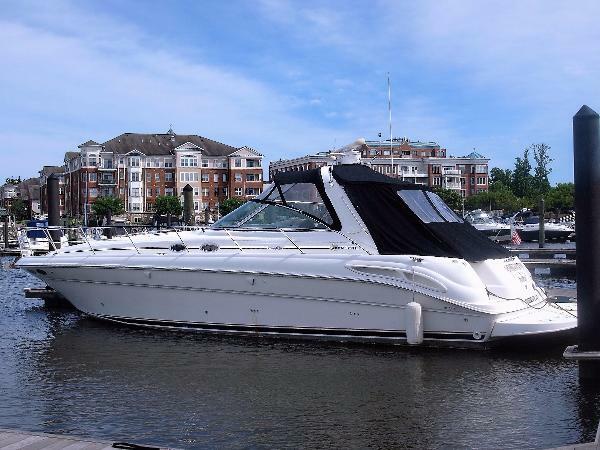 2000 Sea Ray 410 Sundancer A beautiful Sea Ray 410 Sundancer Sport Yacht equipped with the TVD Mercruiser 454 MAG MPI Horizons 380hp (498hrs), Westerbeke 7.0KW generator, Raytheon R80C radar, Raytheon GPS, Raytheon Raypilot 650 AP, VHF, Ritchie compass, Lofrans windlass w/all chain, and more. There is a long list of up-grades including; new fridge (2015), bottom paint and zincs (2015), impellers and isinglass 2014, new audio (2014), batteries 2015. The raised helm provides great all-around visibility and seating for three, with plenty of cockpit seating for a crowd and the sturdy cockpit door allows for easy access to the large swim platform and cockpit shower. The 410 Sundancer is a two stateroom and two head layout, with a complete galley, and comfortable large salon is a great layout for family and friends providing comfort and convenience. 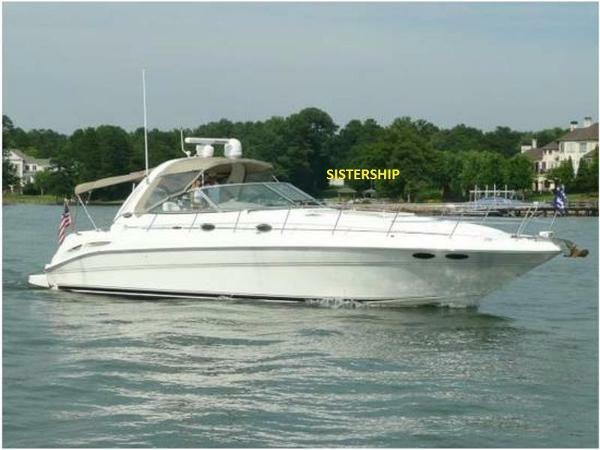 There’s plenty of storage throughout the vessel with plenty of room for entertaining or privacy. 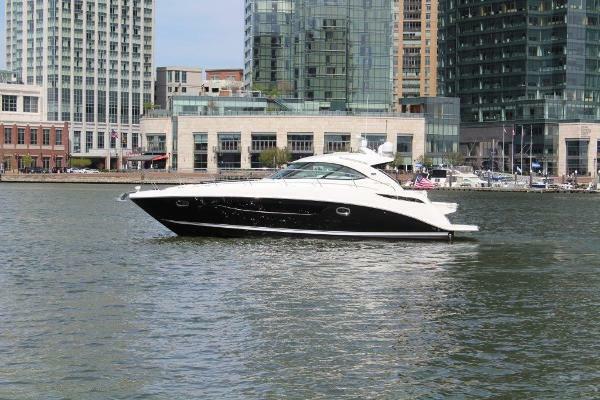 2014 Sea Ray 410 Sundancer The 410 Sundancer blends together the attributes of elegance and practicality featuring a flexible architecture that is adaptable to multiple configurations and cultures. 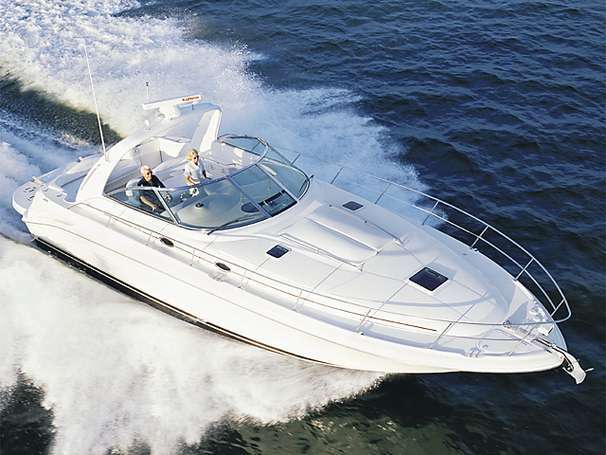 Ideally suited for a day of activities with friends or spending weekends aboard with your family, the 410 Sundancer is the benchmark in its category. With a fast contemporary style, luxurious details and comfortable accomodations, the 410 is the next evolution of the Sundancer concept for the 21st century. 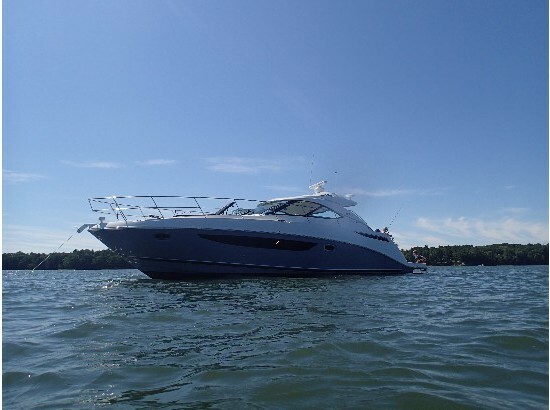 2014 Sea Ray Sundancer 410, Twin Zeus QSB 6.7 380 HP HO Diesels, Blue colored hull, 120v/60 cycle electrical system, Walnut interior package, Wood and carpet flooring upgrades, Open hull windows, Flat screen TV with DVD in mid cabin, Macerator with seacock, Sun pad on forward deck, Fiberglass enclosed hardtop, Opening side windows on windshield, Cockpit defroster, Cockpit fridge, Cockpit grill, High gloss table, Underwater lighting, Raymarine E125w chartplotter, Stainless steel anchor. Shown by appointment only. Call Dan for an appointment. 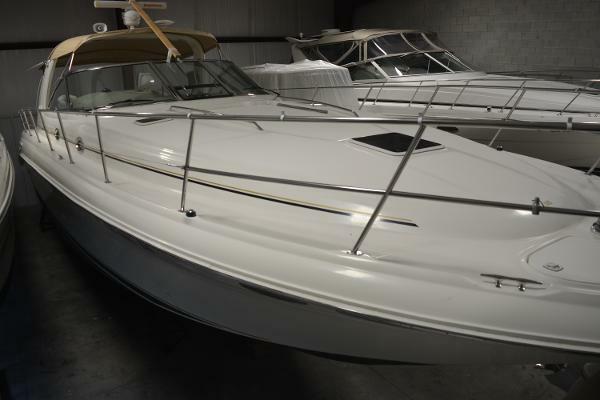 2002 Sea Ray 410 Sundancer Monaco This is a super clean Sea Ray owned by the Second owner for almost all of the boats life. Includes all the standard amenities plus upgraded cherry wood cabinets, new bottom paint in 2016, and more. Please call for additional information. Financing is available. 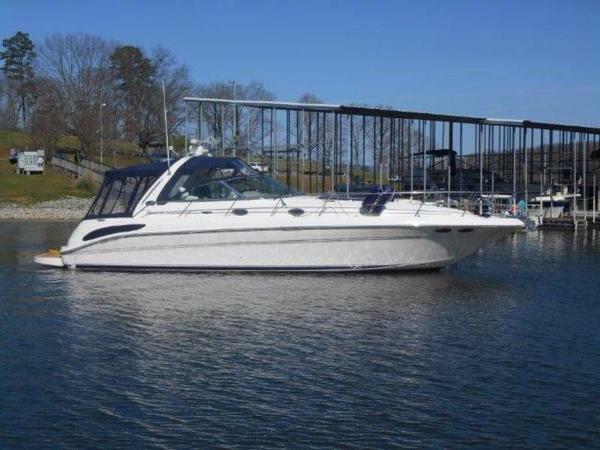 2003 Sea Ray 410 Sundancer 2003 Sea Ray 410 Sundancer This is an immaculately kept 410 Sundancer with about 400 hours on Caterpillar 3126TA (340PHP) engines. It has been undercover on the TN River since 2012. 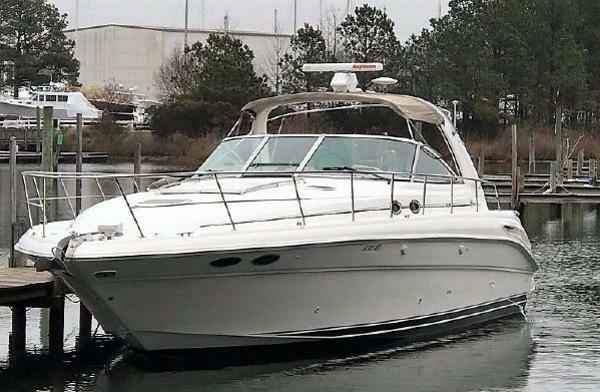 It is equipped with Cherry Vitricore Interior with Milkweed Upholstery; Bow Sunpad; Cockpit Refrigerator; Central Vacuum System; RL80CRC Radar with Open Array Antenna; Autopilot; Engine Synchronizer; Upgraded Interior Fabrics; Custom Aft Deck Camper Canvas; Custom Snap In Infinity Floor Covering in Cockpit & Swim Platform. All services documented with oil sampled at each service since new. 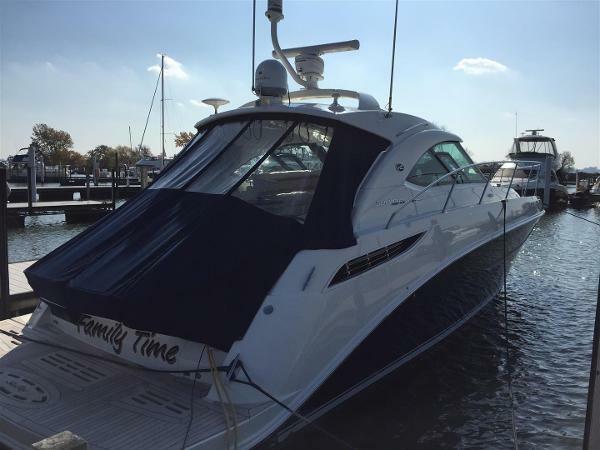 2015 Sea Ray 410 Sundancer 2015 Sea Ray 410 Sundancer, This boat is like new and has under 70 hours on it. I am the first an only owner of this boat. Selling as I am looking to upgrade to a similiarly spec'd 510. It is fully loaded with twin cummins Diesel engines with Zeus drives. It's options over the standard are:Horizon colored Hull,Zeus Pods engine upgrade, Cockpit ACStainless anchor and windless, Canvas Dash Cover, Teak flooring, Wood flooring staterooms, Cockpit grill, Cockpit Hardtop, Cherry wood interior, Transom lighting, Macerator, Universal harmony remote, Screen entry, RC Spotlight, stereo upgrade, Sunpad, Sunroof, TVS, Teak table, Wood cabin table, Flag, Autopilot, Raymarine e series touch gps/radar/fish$679900. Boat is currently dry dockeded inside.